Advanced Aeration Inc. 's Vacuum Bubble® Aerators are built upon sound scientific principles and engineering practices. The bubbles are created under a partial vacuum and consequently, as they enter the water, the higher water pressure surrounding them causes them to collapse further. There are no other, documented aerators with bubbles as small as 0.25mm in diameter. This technology addresses biochemical oxygen demand (BOD) and waste treatment problems by improving the performance of aerobic bacteria. As the aerobic bacteria oxidize waste and consume oxygen, the Vacuum Bubble® Technology Aerator makes additional oxygen readily available by producing very large populations of micro Vacuum Bubbles®. The process is proven to be highly energy-and cost-efficient across a wide range of applications. Most aeration equipment in use today utilizes compressed air systems. 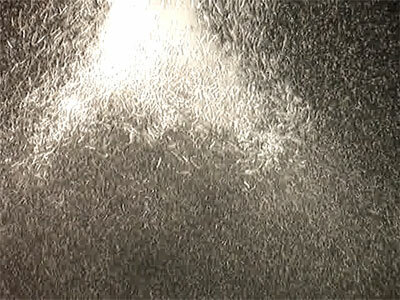 These introduce bubbles of air into the water by forcing the compressed air through a fine pore diffuser, similar to the aerators commonly found in most home fish tanks. Experimental results with these systems have shown that the minimum bubble sizes generated are greater than 3 to 4 millimeters in diameter. Bubbles of this size quickly rise to the surface and are lost to the atmosphere. They do not remain in the water long enough to transfer an appreciable amount of oxygen. The Vacuum Bubble® Technology Aerator, instead of using the compressed air/fine pore system, uses a patented process to create bubbles in a partial vacuum. The micro Vacuum Bubbles® created in this process average 0.25 mm in diameter. The small size of the bubble and the low-pressure gas it holds create a small buoyancy force (The phenomenon which makes bubbles rise in a liquid). This buoyancy force is so small that it is less than the surrounding surface tension of the water. The bubble, in fact, does not rise to the surface, but remains suspended in the fluid. This makes all of the oxygen in the bubble available to be dissolved in the liquid as needed. A VBT™ 100 Aerator was installed in a 55 gallon glass tank with 50 gallons of tap water. A watertight plastic rectangle large enough to hold a Polaroid camera was mounted with a clear plastic grid of 9 mm squares. The aerator was placed 24 inches below the surface of the water. The aerator plate was 2 inches in diameter and had ten 2.38 mm orifices. As the propeller withdrew water from the 12 inch column, a partial vacuum interface formed between the plate and propeller causing water to collapse in the partial vacuum, thus forming the micro Vacuum Bubbles®. The aerator was activated for 60 seconds, shut-off and a Polaroid negative taken of the bubbles accumulated on the surface of the submerged 9 mm square grids. This image was enlarged 3.1X from 3" X 4" film to an 8" X 11" photograph which was examined using a Bausch and Lomb dissecting microscope at 60X magnification. A micrometer slide with 0.01 mm scales was used to measure the diameters of 15 randomly chosen bubbles in three randomly chosen grid squares for each of three one-minute sample periods (See Figure 1). Figure 2 shows the vacuum bubble diameters on the 9 mm scale of the sample grid. An average of 75.8 bubbles per square had a 0.25 mm mean diameter delivering a volume of 0.0082 mm3 per bubble. Oxygen exchange surface area per bubble was 0.1962 mm2. Common compressed air diffusers, which are found in many municipal and industrial waste treatment processes, frequently produce bubbles 20 mm or greater in diameter. Not only do these bubbles have a small total surface area for a given volume pumped, they also rise to the surface quickly, and are lost to the atmosphere. Advances in fine-pore diffusers have led to the development of aeration systems producing bubbles averaging 3 to 4 mm in diameter. This represents the state of the art in compressed air systems. Compressed air diffusers produce bubbles 20mm or greater in diameter. Fine-pore diffusers produce bubbles between 2mm and 4mm in diameter. 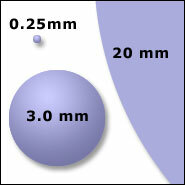 VBT™ creates bubbles 0.25mm in diameter.